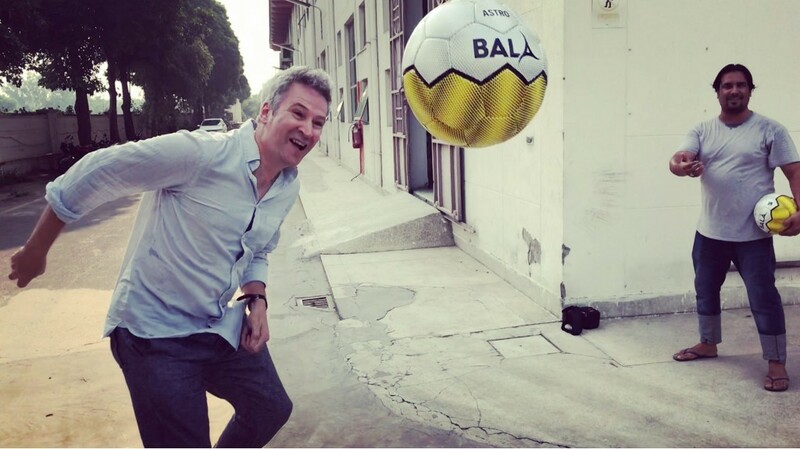 Bala Sport was set-up specifically to ensure that sports ball workers in developing countries get a fair deal. 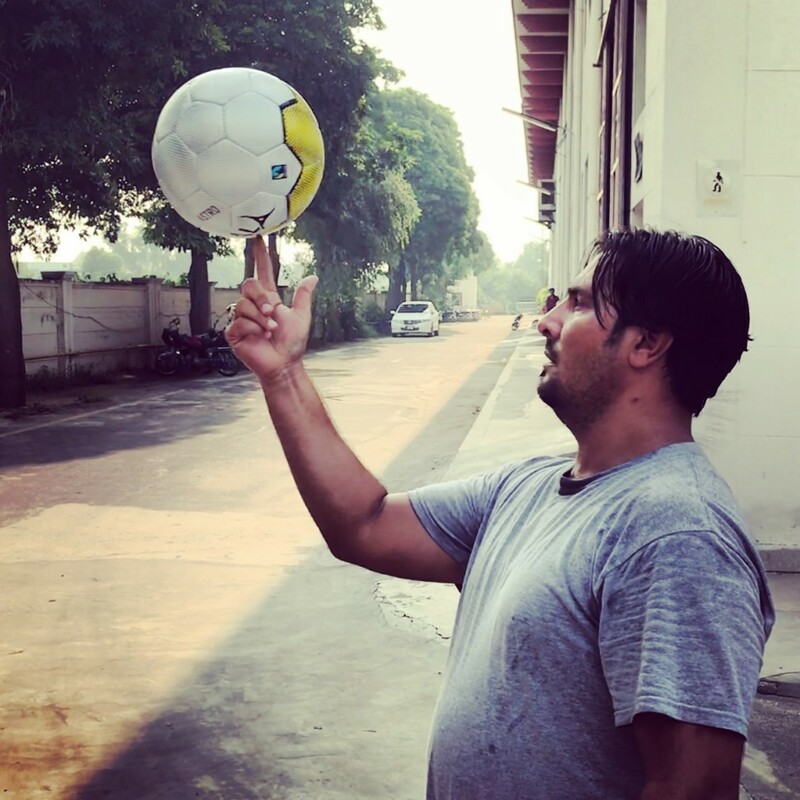 So, with the workers in India where our rugby balls are made and in Pakistan where our futsal balls are made being at the core of what we’re about, we like to visit the factories we use and meet the workers at least once a year. On the 7thof August and after a fifteen and a half hour journey through the night with only a couple of hours dozing on the two flights I arrived in Sialkot, in the Punjab area of Pakistan at 8.30 in the morning and in the 33 degree heat and very high humidity. After a quick shower it was straight to the factory to discuss a big custom ball order, see the new technology the factory is focussing on and of course chat to some workers. Having worked in canned and frozen food factories myself when I was a student I know they’re a pretty challenging environment to work in. That’s why you need proper breaks, decent food and some good crack with colleagues. So when workers are smiling and having a bit of a laugh you know they’re happy enough with their lot. 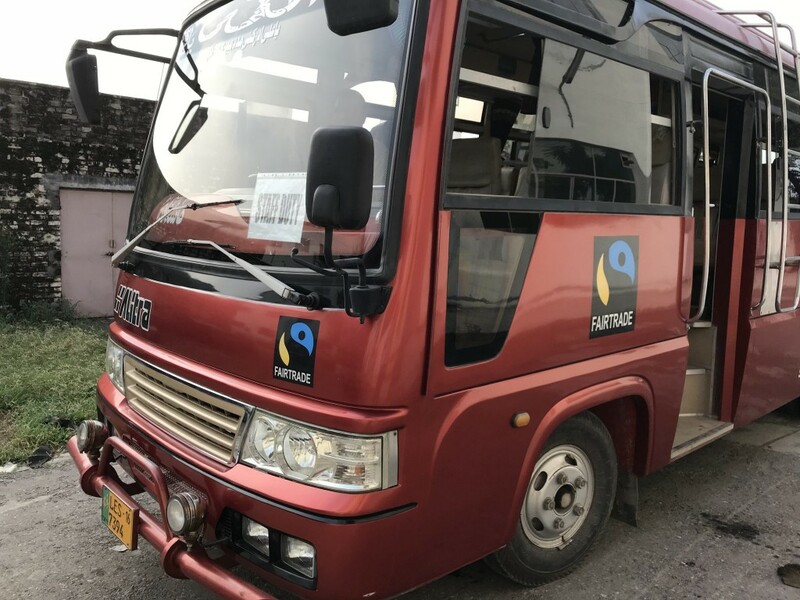 This factory is family run and they care about their workers, and the Fairtrade certification ensures that standards are maintained. I’m more the ‘born with two left feet’ kind of footballer but it was good to have a bit of a kick-about with a couple of the guys who make our Fairtrade footballs. Cricket obviously is the big sport in Pakistan with footy very much in the minority, but a few of the workers do play, and this machine stitcher showed he’s pretty skilled with ball tricks. 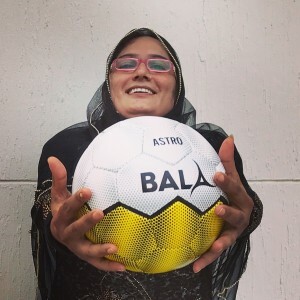 Being in a very competitive market where the big brands are moving towards thermal bonded ball production Bala Sport has to also move with the times. 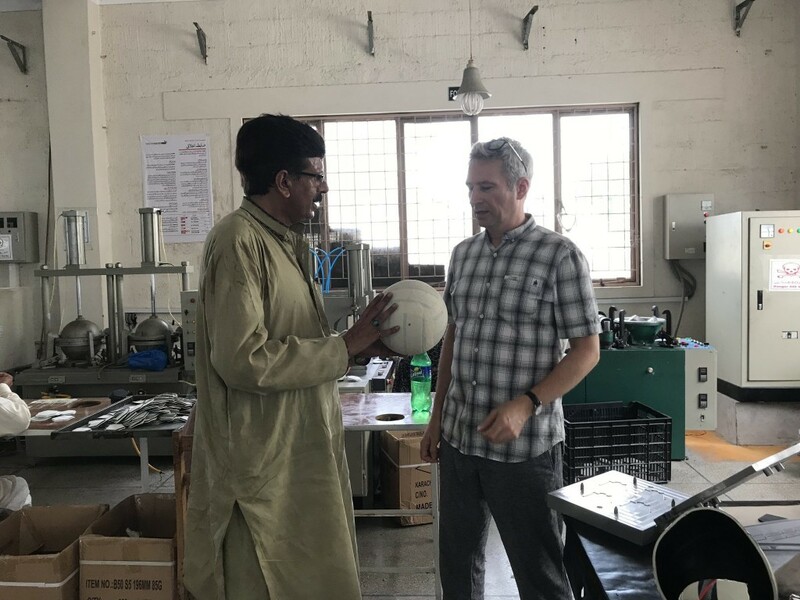 One of the discussions I had with the factory bosses was about the future for the skilled hand-stitchers who make our Team, Astro and Pro footballs. The pic above shows the machine used in the new thermal bonding process. Half of the hand printed panels are glued together by their edges and placed in the two halves of the machine. The rigid bladder is then placed in side and the machine closed. When the heat’s applied and opened the ball is complete. Thermal bonding involves no stitching so obviously there’s a concern for these workers. However the process requires workers to perform other parts of production and for a few years now the factories have been finding it harder to find hand-stitchers, so the move shouldn’t have as big an impact as it might. We’ll still be making hand-stitched balls for the foreseeable future though. 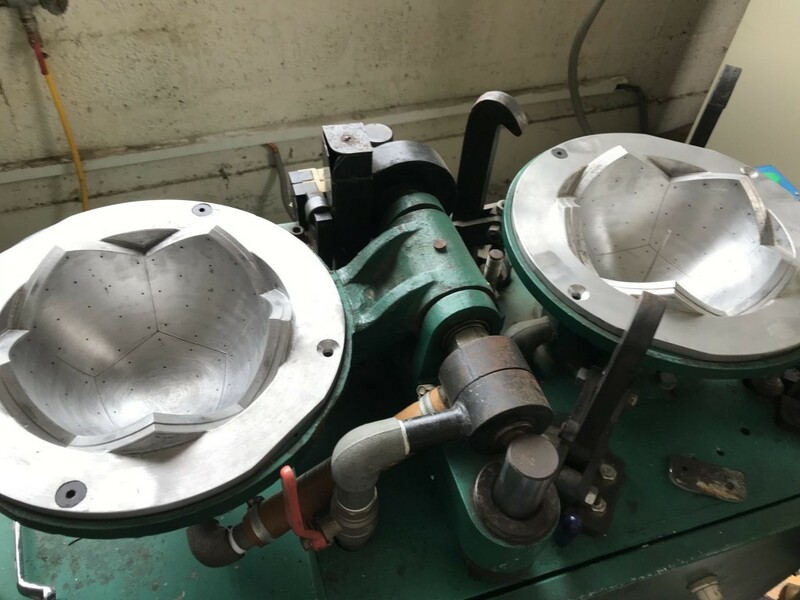 The thermal process produces a rounder ball as the panels are glued together and reinforced by heat around a bladder which can’t be deflated, producing a smoother seem between the panels. It was great to see some sample balls for a new addition to our range being made. This is the quality assurance manager showing me how the inflated butyl bladder is wrapped with 18 panels to keep it rigid. The outer panels are then stuck to this. 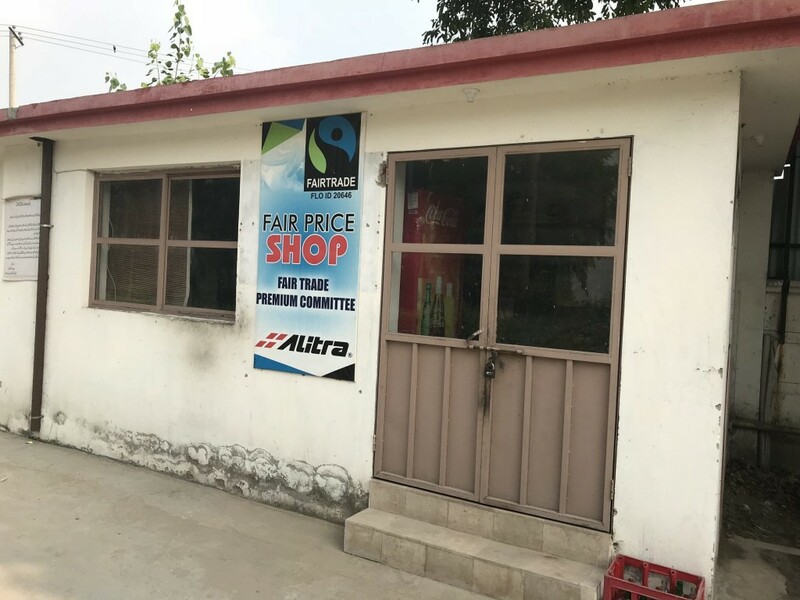 Reminders of the value of the Fairtrade Premium, the extra 10% we pay per ball we order that goes directly to the workers through a Fairtrade Premium Committee are everywhere. The Fair Price shop offering cut price food and household items, and the busses that take the women and men to and from work and their outlying districts for free are impressive. 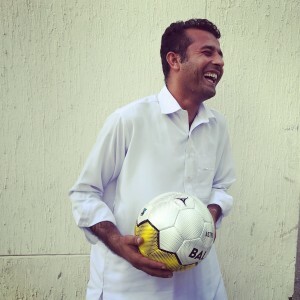 In order to keep up these Premium payments to the workers we need to sell more balls, so please spread the word to your local school and footy team that they can choose Fairtrade certified balls that are great in quality and performance, made to FIFA equivalent standards and that really make a difference and change lives in Pakistan.